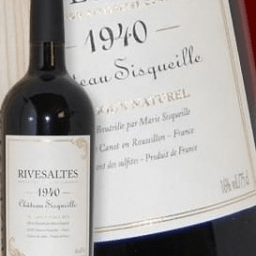 1940 Rivesaltes wine Chateau Sisqueille. A faded, copper colour. A big complex nose with hints of sweetness. This is medium-sweet on the palate like a fine old Verelho. Long and rich but finishes drier. For someone born in 1940 this would be an absolute treat.